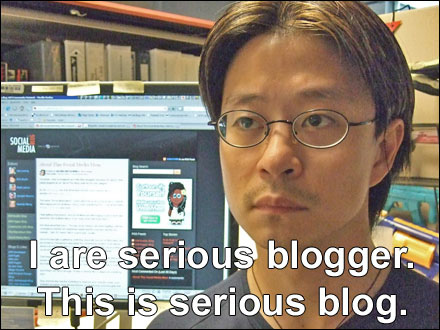 Well, what does your blog say about you? More than you would think. Certainly spilling your brain on the page should reveal who you are, but there are also quite a few services that you can use to evaluate your blog, and in some cases its gender or its personality. Is it possible that your blog writing style could be very different from what you believe your personality and characteristics are? Sure, I think so. People can change their mentality when they write; they can change who they are. Wordle.net is able to generate a word cloud that shows you which words you are using the most in your blog. This is not a tally list, but a visual representation of your most often used words. The words that are used most appear larger. It’s a nice visual snapshot of the words you use most. Gender Analyzer uses Artificial Intelligence to read your blog and determine if it was written by a man or a woman. Behind the scenes, a text classifier hosted at uClassify.com has been trained on blogs written by men and women. A month ago, Gender Analyzer told me that my blog was written by a woman. However, I must have written about very manly things since then, because it now realizes that this blog is written by a man. And to keep it that way, let’s load this paragraph with some uber-masculine keywords: football, chicks, balls, beer, mustache, fight, piss, gun. Typealyzer analyzes your blog to tell you what your Myers-Briggs personality type is. It also gives you a really cool visualization of a brain map that shows the part of the brain you’re using when you write. This blog (mikemywords.com) is an ISTP (Mechanic). The site’s description is this: The independent and problem-solving type. They are especially attuned to the demands of the moment are masters of responding to challenges that arise spontaneously. They generally prefer to think things out for themselves and often avoid inter-personal conflicts. The Mechanics enjoy working together with other independent and highly skilled people and often like seek fun and action both in their work and personal life. They enjoy adventure and risk such as in driving race cars or working as policemen and firefighters. This is somewhat peculiar, because for years, my Myers-Briggs tests have shown that I am an ENFJ. An ENFJ (which you can read about through the hyperlink) is quite literally the opposite of an ISTP. In Myers-Briggs, you are an E or an I, an N or an S, an F or a T, a J or a P. So, ISTP seems to be the opposite of ENFJ. Again, perhaps proving the point that your “blog voice” may be quite different than your real self. This is something to be conscious of. Who are you when you are writing your blog? Who do you want to be when you are writing your blog? After looking at the word cloud, the gender and the personality of your writing – do you want to change the style of your writing to better fit who you actually are? Hey dude, want some cute boots? 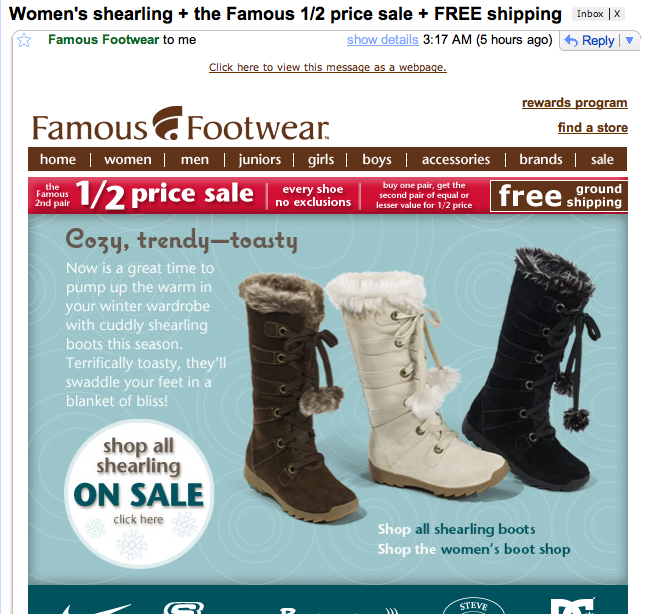 I received an e-mail offer from Famous Footwear this morning. Awful. Yes, I did sign up to be on their mailing list so I could get my 20% off at the counter one afternoon – that’s not the issue. Visually, it was on brand – that’s not the issue. It was the subject line and the content of the e-mail: it was about women’s shoes! Now, I’ll concede that probably most of Famous Footwear’s mailing list and clientele are female. But, this is e-mail marketing! You can easily segment your messages based on any number of things, including gender. There should have been a male-centric e-mail and a female-centric version of this e-mail. Tsk tsk! Data collection and segmentation is becoming easier and easier (not to mention more and more necessary), and needs to be used appropriately. Hitting a customer by gender is just one example of e-mail marketing segmenting. You should be able to tell what kind of shoes I’ve purchased in the past, and customize a message based on that. Don’t you think I would be more inclined to make a purchase if there was an offer about something you know I like? As marketers, we have such a buffet of information at our fingertips about our clientele. New media allows us to collect even more data and learn how to better serve our end user – no matter whom that is. So, sit up and think about how you use the data you have. Are you still just sending out the same blind e-mails? Are you offering women’s boots to men? (For the record, my purchasing history includes NO female shoes or boots). You’ve been collecting the data – now analyze it and use it and give your company a great chance to make a transaction. As a final aside – I loathe that I opened up that e-mail, because it will be recorded as a successful e-mail, but I had to get that screen capture. See my post from Sunday – you get what you consume. Don’t want strategically crappy e-mails? Stop opening them! Ugh – my bad. Repost from Seth Godin’s blog. Perfectly said. The lesson that society should take away about all marketing is a simple one. When you buy a product, you’re also buying the marketing. Buy something from a phone telemarketer, you get more phone telemarketers, guaranteed. Buy a gas guzzler and they’ll build more. Marketers are simple people… they make what sells. Our culture has purchased (and voted) itself into the place we are today. The wine and web marketing expert Gary Vaynerchuk was canvassing on the streets of New York on Wednesday night: bringing the “Yes We Can” mantra to the web community. The meetup, co-organized with Mashable, began as a cozy indoor networking affair. But with high volume levels inside, the group gleefully marched out to the street for an upbeat pep talk; a location much more suited to the themes of improvisation and resourcefulness. The full video of the “sidewalk keynote” is posted below, courtesy of CenterNetworks. (Warning: contains strong language throughout.) Or skip to the “7 Points” below for our summary. 1. “Hustle” – improvise, be resourceful, do whatever it takes to care for your community. Tough times require creative solutions. 3. “Large companies will cut social media because they don’t understand it” – the longer the big players stay away from new web technologies, the greater the opportunity for new entrants. 4. “The new barrier to building a brand is your time, not your pocketbook” – nobody can stop you from starting a global media brand from your house; all you need is time. 5. “Telling main street about Twitter is a waste of time” – keep it quiet; knowledge of new web technologies is your competitive advantage. 6. “Take Your Money” – go to Google, type in the keywords in your space. Look at the ads next to the results: these are people who pay to market in your niche. Call them. Convince them to spend those dollars on you instead. 7. “Anything that gets eyeballs is monetizable” – 2500 unique visitors a day should be enough to live on. I guess people really want LinkedIn to not be another dead-end business network. I have a LinkedIn profile. Many people do. But, I don’t use it that much – do you? I have heard LinkedIn referred to as an “online Rolodex” more than a social network. While the debate about people using it remains, it has been growing rapidly – in fact, according to Nielsen Online, LinkedIn is one of the fastest growing social networks between 2007 and 2008, growing 187% (yes, that’s more than Facebook, which grew 77% from 07 to 08). I think last time I checked, LinkedIn was approaching 10 million unique visitors. Hard facts aside – anecdotally, I rarely find somebody who USES LinkedIn after they sign up and make some connections. It seems the only time people go back to LinkedIn is to accept a connection. So, is LinkedIn really going to take? Are people going to use it as a legitimate business and networking tool? In the past few days, I’ve gotten updates that LinkedIn is going app crazy. From ways to create projects and collaborate, share information or customize your profile. Here’s a short list (full disclosure – most of this section is LinkedIn’s wording). Maybe this will help? Box on LinkedIn: Share files and collaborate with your network. Huddle on LinkedIn: Private workspaces to collaborate with your network on projects. Share information and keep up to date with your network. Amazon on LinkedIn: Discover what your network is reading. TripIt on LinkedIn: See where your network is traveling. SixApart on LinkedIn: Stay up to date with your network’s latest blog posts. Google Docs on LinkedIn: Embed a presentation on your profile. SlideShare on LinkedIn: Share, view and comment on presentations from your network. WordPress on LinkedIn: Promote your blog and latest posts. Company Buzz by LinkedIn: See what people are saying about your company. There’s also a blog dedicated to using LinkedIn (tough to say how deep the connection between the blogger and LinkedIn is). But, there are some decent tips there: The LinkedIn Personal Trainer – ways to use LinkedIn. There is actually a pretty interesting article about how people in the financial industry are using LinkedIn a LOT in the past several weeks. What’s your take? How do you use LinkedIn? DO you use LinkedIn? You won’t catch me writing about politics much (if at all) on this blog. Why? I hate politics, for a number of reasons. But, my attention has been particularly heightened by this year’s election season and I’ve been reminded of my pejorative feeling toward politics. Now, don’t get me wrong – I am not a cynic. And this posting actually concludes on a hopeful note. However, I continue to see something fundamentally wrong with the way we engage in “politics” in America, and I have to use this forum to point it out. Why do I hate politics? Two reasons: Party Lines and Marketing. What is the purpose behind electing representative leaders – especially President of the United States? Well, obviously, to represent us, but more importantly to do what’s best for the United States of America. How do we find the leader that is best for our country? Well, typically, we whittle the candidate down to a nominee for two political parties – Democrats and Republicans. Of course, there are independents, etc, but they never get enough attention, so we’ll not talk about them here, either. 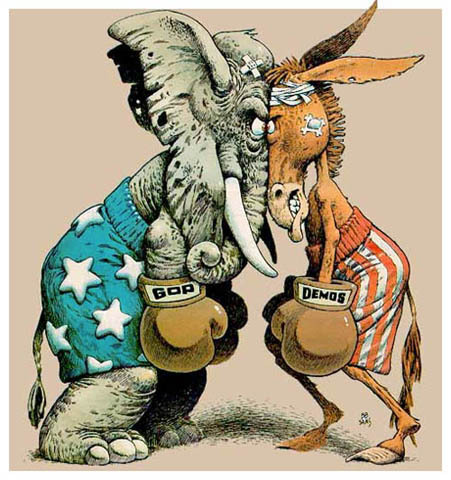 By the way – it is actually pretty interesting to read about why we have two main political parties and how they evolved. Here is a link to learn more about Democrats and Republicans. OK, so what’s wrong with political parties? EVERYTHING. People are so incredibly blinded by political lines, that I fear we actually hurt our chances to progress as a nation. We so blindly follow our political lines that we ignore all else. I have often seen perfectly reasonable, polite and intelligent people become monsters to defend their party lines. They name-call, get angry and get hateful. Very hateful. Why? Because you are not a Democrat. Or because you are not a Republican. This two-party political system seems to only DIVIDE a nation, not unite it. It seems laughable to be called the United States of America. What has become of paramount importance is NOT finding solutions to our problems and growing stronger as a nation, but rather that OUR TEAM WINS. We are not Americans, we are rabid fans. Our personal identity is so connected to our party affiliation, that a loss for our party is a loss for us. Somebody who isn’t the same political party as us is “stupid” and “ignorant.” Don’t lie to yourself and tell me that you don’t think that way. Tonight, Barack Obama won the presidential election. During John McCain’s concession speech, he simply mentioned Obama’s name (nothing negative, just mentioned it) and the crowd reacted with a booing crescendo. WTF? Uncalled for, crowd. It is always the red team versus the blue team. It divides us as a nation. This is why I dislike the marketing of politics. Now, marketing is not an unfamiliar topic for this blog, but its connection to politics is. This marketing is primarily about winning (duh – nobody expected it not to be). But, the marketing goes far beyond the TV commercials. Every candidate has a campaign manager – they decide how to position the candidate versus their competitor. They decide the target audience, the message and the media. These is marketing – open your eyes. You are being SOLD on a candidate. Now, I’m not complaining about mudslinging – that’s been an issue for years. But, I do get irritated that the idea is to sell me, and sell me hard. History has shown that candidates try to fall as far “left” or as far “right” as they can to get their party nomination. Once they get that, it’s time for the “dash to the center” – in other words, trying to present themselves as attractive to both Democrats and Republicans, to win the election. Politicians want us to vote along party lines. They want us to dislike the other candidate and dislike those who support that opposing candidate. We jump at opportunities to catch the opposing party losing. It’s all a game. Root, root, root for the home team – if they don’t win, it’s a shame. The Party Lines build their army. “We want Republicans to control the House!” “We want Democrats to control the Senate!” It’s about one team controlling the nation over the other team. Even outside of the election, we maintain our blind alliances and make legislative decisions based on party lines. You wouldn’t dare cross party lines, would you? You traitor!!! I have thought, for a number of years, that the country would be better off if we eliminated party lines. I have thought we would be better off to simply have non-partisan candidates. What’s the quote – “It’s amazing what we can accomplish when nobody cares who gets the credit.” What if it was just about electing leaders who could improve our country? I know, this is overly idealistic. I don’t know that this would ever be possible at this point. But, I still believe that if we maintain a two-party system of Democrats and Republicans, then we will continue to be divided as a nation. We do not need yet another reason to divide ourselves. We already have race, religion, economic class, gender and sexuality. I imagine a country that is united. And I do believe it is possible. That’s what I want for our country: No Republicans. No Democrats. Just Americans. Don’t interpret this as client-bashing. Most every client I have is wonderful, and many of them “get it.” However, over the years, I have been involved in meetings in which a perfectly great solution to a communication/marketing issue was reduced to mush after multiple rounds of client changes. I think that many of you can relate to this situation, and one video really captured this frustrating process. I know it’s been around for a while, but I just ran across it again, and it made me laugh.